I am pre rending a product field. The product field is a radio type and it is required. This is my pre render code. It works fine. I dont understand why it wont pass the validation even when it is selected? 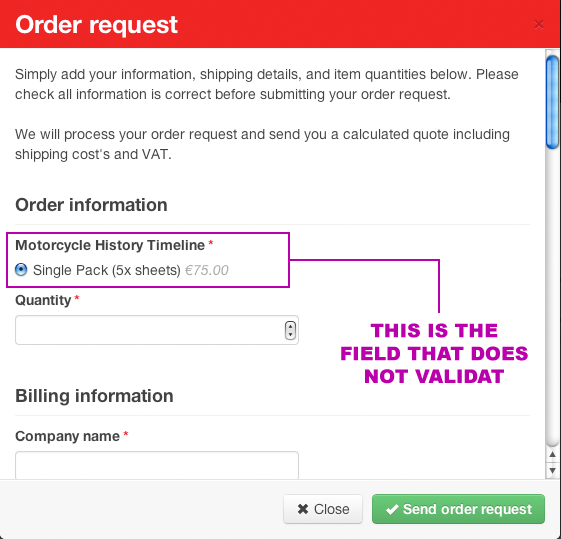 Any help into understanding why I am having validation issues would be great thanks. Hi chris, thanks for getting back so quick. This looked promising but no it does not change it? If you click the green order button. A pop up should appear. I'll ask the development team if they have any ideas for you. Maybe there is something I've overlooked. Thank you. Hi Chris. Thanks for looking into this for me. I think it might be an issue with the pricing fields. The site maybe going live today - and going over checks, etc, so I need the form to work. So what I have done for temporary measures is removed the product and the quantity field. Then replaced them with the standard radio field (item) and the number field (quantity). The form id=2 now submits fine but I cant calculate a total from this automatically. I duplicated my orignal broken form id=2 and is now a test form id=3. If you require admin access, please send me your email and I can make you a admin user if you wish to investigate the form setup? We have had a slight issue. My colleague sent the link to the client and the client sent the link to the customers. Before it is even finished. So what I have done is locked the website from the public to stop the customer using it. I will need your email when you get round to this create you a user account so you can access the site/form again. I'm happy to take a look. You can send any login info to david[at]rocketgenius[dot]com. Hello, I have made you an admin. But you should get the password for your user to your email. Please contact me on my admin email if you need any instant questions answering. I removed the passwords from this topic.